Stunningly presented throughout is this fabulously spacious four-bedroom detached dormer bungalow. Positioned on a much larger than average plot in a popular area of Mapplewell within close proximity to all local amenities within the village. We highly recommend an internal inspection to appreciate the size and presentation of this beautiful family home. A timber glazed entrance door leads into the hallway which in turn provides access to the lounge and the stairs leading to the first floor. Beautifully light and spacious featuring a modern grey carpet, neutral décor, modern vertical central heating radiator and large double-glazed window with stone sill looking out over the front garden. The focal point to the lounge is the multi fuel burner which is positioned in the corner of the room with a feature fire place to the side making a useful fuel store. A doorway leads from the lounge into the inner hallway which in turn gives access to the remaining ground floor rooms and features a central heating radiator, neutral décor and useful under stairs storage cupboard. A fabulous size family kitchen featuring a range of matching cream coloured cupboards with complimentary worktops over and tiled back splash. The kitchen also features a large Rangemaster cooker, fully tiled floor, neutral coloured décor, central heating radiator and large double-glazed window over-looking the front of the property and the views beyond. A double-glazed entrance door to the side gives access to the driveway. A useful multi-functional room currently used as a dining room featuring oak laminate flooring, neutral coloured décor, central heating radiator and multi fuel burner. An opening leads to the conservatory. A fabulous addition to the property is the rear conservatory which is open from the dining room and features a continuation of the oak laminate flooring, neutral coloured décor and two doors giving access to the beautiful private rear garden. Beautifully presented and fitted with a matching three-piece suite comprising of walk in shower with glass screen, pedestal hand wash basin and wc. Also featuring fully tiled floor and walls, chrome towel radiator and obscure window to the side. A spacious ground floor double bedroom featuring neutral coloured décor, neutral coloured carpet and double-glazed patio doors giving access to the rear garden. Currently being used as an office this god size second bedroom features beech laminate flooring, neutral coloured décor, central heating radiator and fitted wardrobes to one wall. Stairs from the ground floor rise to the first-floor landing which gives access to two first floor bedrooms and the family bathroom. A magnificent size first floor bedroom featuring neutral coloured décor, neutral coloured carpet, down lights to the ceiling, central heating radiator, double glazed window over-looking the rear garden and a dormer window to the front with far reaching view. Fitted sliding wardrobes and two built in stores provide an abundance of storage space. A further good sized first floor bedroom featuring neutral coloured décor, neutral coloured carpet, central heating radiator and double glazed window providing excellent views over the rear garden. The room further boasts a fitted blind and provides good space for wardrobes. A fabulous first floor family bathroom featuring a modern four- piece suite comprising of beautiful free- standing roll top bath with chrome mixer tap and shower head, separate walk-in shower cubicle, wc and hand wash basin. The bathroom also features fully tiled floor, chrome towel radiator and double-glazed window with far reaching views. 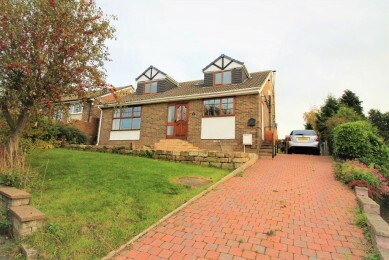 To the front of the property is a beautiful block paved driveway providing ample parking leading to the rear garden. There is also a lawed area. To the rear of the property is a private, beautifully presented rear garden featuring a good size lawn area, a fish pond with safety netting, garden shed, summer house and a greenhouse. There is also an allotment to the top of the garden.